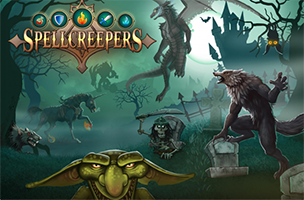 bitComposer Online and Neobird have announced Spellcreepers for Facebook. The game is already available on iOS and Android devices, and challenges players to take control of up to 32 monsters as they enter into single and multiplayer match-three puzzle duels. The game mixes these puzzle game elements with those from RPGs, as users will collect weapons and defensive equipment to make their monsters stronger over time. The free-to-play puzzle game offers level-based single-player battles against AI opponents. During battle, users can remove up to six symbols from the board on each turn, with each relating to an attack or defensive action. Swords and fire tiles, for instance, will cause damage to the opponent, while potions and shields increase a monster’s defense points or health. Users can also match coins, which are used later on. Users create matches by tapping and dragging on matching, touching symbols, like three swords or three coins, whether they’re in a straight line or not. These turn-based battles end when one player has run out of health points, and players can receive instant prizes from treasure chests held by these computer-controlled opponents. In the game’s multiplayer arenas, users take on others from around the world in real-time battles. Once players have earned enough free or premium currency, they can head into the game’s store to purchase offensive and defensive items for their monsters, including swords and helmets, among others. These items are passive, in that they alter the way future battles play out, but don’t require manual use. A sword may make all future sword symbols more powerful, for instance. The game’s cross-platform support will allow players to keep their progress across devices, while the game’s statistics tracking gives players the chance to compare their progress with their friends. Spellcreepers is coming soon to Facebook, as well as standalone browsers. Check back soon for more, or to follow the game’s mobile version on AppData, our tracking service for mobile and social apps and developers.